"All the guys playing in Traverse are fighting tooth and nail and doing whatever they can to get noticed, so there's a lot of guys who will do things out of character just to make an impression. It's really physical and intense and that's something I enjoy." Don't be surprised if a future Conn Smythe Trophy winner is skating among the 150-plus players at the 10th annual Detroit Red Wings Prospects Tournament in Traverse City, Mich., this year. 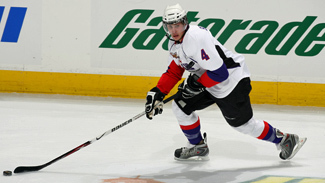 After all, it was just six years ago that a 22-year-old Swede named Henrik Zetterberg, Detroit's seventh-round draft pick in 1999, participated in the developmental tournament. Zetterberg, as we now know, was awarded the Conn Smythe as MVP of the Stanley Cup Playoffs this past season when he helped lead the Wings to a five-game triumph against the Pittsburgh Penguins in the Cup Final. "It's very possible the next playoff MVP could be skating in Traverse," said Detroit General Manager Ken Holland, the brainchild of the six-day tournament. "Guys like Zetterberg, Dany Heatley, Pavel Datsyuk, Jiri Fischer, Niklas Kronwall and Ilya Kovalchuk have all played in this tournament, so lots of NHL stars have started their pro careers here." The tournament, which begins Sept. 13 at the Centre I.C.E. Arena, expanded to eight teams in 2006 and has become an annual opportunity for coaches and GMs to evaluate their prospects against their peers. The same seven teams that accompanied the Red Wings to Traverse City the last two years return this season, including the Columbus Blue Jackets, St. Louis Blues, Minnesota Wild and Dallas Stars in the West Division. Joining the Wings in the East are the Tampa Bay Lightning, Atlanta Thrashers and New York Rangers. The Rangers scored a 5-1 victory against the Jackets in last year's prospects championship game. Each team is guaranteed four games, including three against each divisional opponent, before entering the final day of competition on Sept. 17. "For one week, you've got your staff and prospects together," Holland told NHL.com. "Let's face it, once the NHL players show up, most of the energy is directed toward the real players and team. This is important because we can really focus on our kids and watch them perform. You always want to make your young players as comfortable as possible because they'll play their best when they're comfortable in their surroundings. "It's a smooth transition into training camp (Sept. 18 in Traverse City) since, after playing against their peers, they can take that next step to the main camp." Six of the tournament's top-11 point producers last year actually earned time in the NHL this past season, including Cal Clutterbuck of Minnesota. St. Louis center Patrik Berglund, who led the tournament with 10 points (four goals) last year. He will return to Traverse along with Clutterbuck, a third-year performer. Both players are hopeful they will earn considerable playing time with their respective NHL teams this season. "All the guys playing in Traverse are fighting tooth and nail and doing whatever they can to get noticed, so there's a lot of guys who will do things out of character just to make an impression," Clutterbuck said. "It's really physical and intense and that's something I enjoy. Having a chance to put on that Wild jersey and have that feeling of being part of the team and organization was a great experience." "It was nice to lead the tournament in scoring (last year), but it wasn't easy," Berglund said. "I'm going back to do my best and try to be a leader on the ice this time around. The best part about Traverse is getting to know the players in the Blues' organization. It's great to be playing a lot of games instead of just sitting in St. Louis working out and practicing. It's good experience and, coming over from Sweden, was the first time I really got a chance to play good hockey in North America against good players. I feel Traverse helped my development heading into the main camp." That's precisely what Holland envisioned when he began the tournament in 1998 with the assistance of local banker Pete Correia. "I'm a fan of all sports and appreciate what baseball does with the development and evaluation of their players," Holland said. "They keep their kids moving around the clock, throughout the year. I feel the best way to evaluate young players was to watch them against players their age rather than having them out on the ice with players much older and wiser. It would have been difficult for any of these young players to go up against the Steve Yzermans or Brendan Shanahans at training camp, but this setting gives them a chance." Holland is extremely grateful for the effort put forth by Correia and his 200-plus volunteers, who have traditionally turned the tournament and Detroit's ensuing training camp into a first-class event. "Pete is the one who really got the entire city behind the idea of moving training camp from Joe Louis Arena to Traverse and then, incorporating the prospects tournament," Holland said. "Over the course of our 12 days in Traverse (including Wings training camp Sept. 18-23) these volunteers take time off from work and do so much for all of us in order to make our stay as enjoyable as possible. "Whatever you need, you just have to talk to Pete Correia and it's done. He's the guy with all the contacts in the city. The Traverse tournament might be the brainchild of the Wings, but Pete Correia is the one who makes it all happen." Correia realizes the benefits of hosting the tournament in Traverse. "I think the tournament is great for our little community, which is really a small tourist town (270 miles north of Detroit)," he said. "We have people waiting a few days for tickets to go on sale so you'd think it was the Stanley Cup or something. But the fact is some of these folks have never been to a Red Wings game in Detroit, so this is their chance to not only see their team up close and personal, but watch seven other clubs."